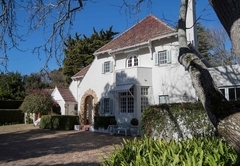 Chambery is a highly recommended guest house with self catering option, providing accommodation in Kenilworth for tourists visiting the Southern Suburbs region. 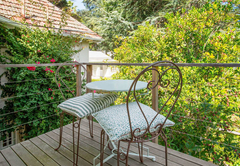 Chambery is situated in Upper Kenilworth in a lush tranquil garden where birdsong abounds. 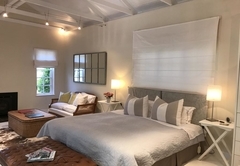 We offer luxury accommodation in our two guest cottages, which are sumptuously decorated, and it is conveniently situated for both business and holiday travelers. The area itself is in a very quiet “pocket” in Kenilworth where little traffic noise is experienced. 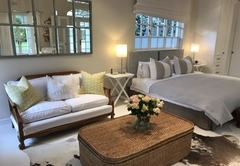 Chambery has a country feel yet is only minutes away from major shopping centres, Newlands Cricket and Rugby stadiums and 15 minutes from Green Point Stadium, the city centre and beaches. 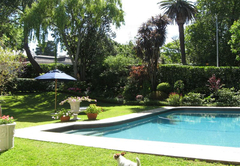 It has easy access to the peninsula's tourist attractions and the many golf courses. 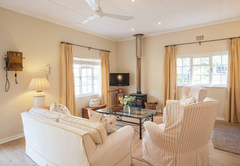 The two beautifully appointed guest cottages are totally private in the large grounds. 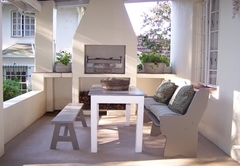 Each has an individual private area in the garden to sit and relax and unwind. A substantial "continental" breakfast is served either in the main house dining room or in each individual cottage. 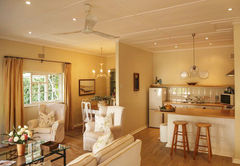 The cottages are also let out on a self-catering basis. 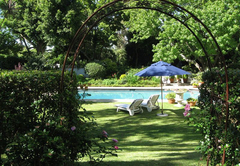 There is a large salt water swimming pool and patio exclusively for guests' use. One cottage is wheelchair friendly. 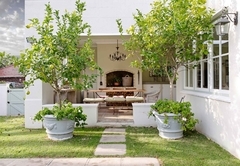 Situated at the end of the expansive driveway this cottage is the larger of the two. It comprises of a large living room area to which is annexed a small but comfortable dining room which can be doubled up as a workplace. 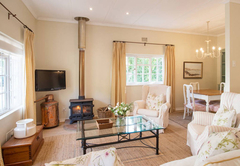 The cottage is furnished with either a King-size or twin beds upon request and has multi channel Satellite TV, wireless internet and a cosy fireplace making for all round comfort. 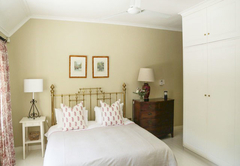 The rooms are heated and supplied with fans, heaters, hairdryers and heated towel rails. The tastefully decorated bathroom is fitted out with a Victorian slipper bath, under floor heating. 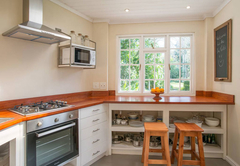 This cottage is fitted out with a separate kitchen which is fully equipped with hob and stove together with the usual kitchen appliances that guests necessarily require. The Loft Suite is a double room with a King-size bed with bathroom en suite. 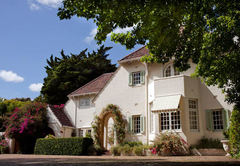 It has its own private entrance up a flight of stairs with lovely balcony overlooking the garden it sleeps 2. There is a bar fridge with tea / coffee facilities. Laundry and dry cleaning services are offered. There is plenty of secure parking inside the property for all visitors. 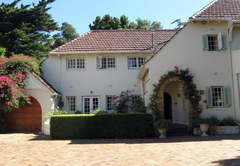 • Golf Courses: Westlake, Steenberg, Mowbray and Clovelly. 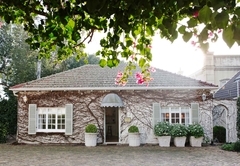 The cottage sleeps two people in a king-size bed or twin beds. It has a full kitchen, diningroom for 4 and a wonderful English woodburning stove. 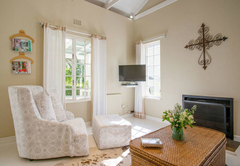 It can be let on a self-catering basis, is fully serviced and features satellite TV, wireless Internet. 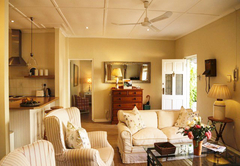 Features: Twin beds, King beds, En-suite, Self-catering, Television, Satellite TV, Tea and Coffee Facilities, Wi-Fi. 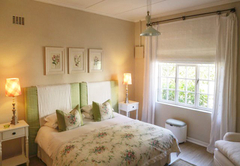 This is a spacious double room with a private entrance, balcony overlooking the garden and bathroom en suite. Please note breakfast is an optional extra. 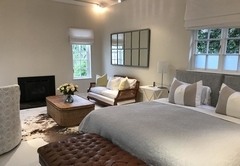 Features: King beds, DStv, En-suite, Balcony/patio, Upstairs, Single beds, Garden views, Fan, Heater, Tea and Coffee Facilities, Bar Fridge, Wi-Fi, Internet Connection, Safe, Hair Dryer, Swimming pool views. The Studio sleeps two people in a king-size or twin It can be let on a self-catering basis, is fully serviced and features satellite TV, wireless Internet, and a cosy fireplace. It has a full kitchen and outdoor barbecue area. Breakfast is an optional extra in the winter months. Features: Twin beds, King beds, En-suite, Self-catering, Single beds, Television, Satellite TV, Tea and Coffee Facilities, Wi-Fi. Tolle Lage, wir haben uns hier auch bei Cheryl sehr wohl gefühlt. Zimmer war erste kllasse! Alles Prima! Wonderful location, excellent host, beautiful suite! We thoroughly enjoyed our stay and would definitely recommend it to others!